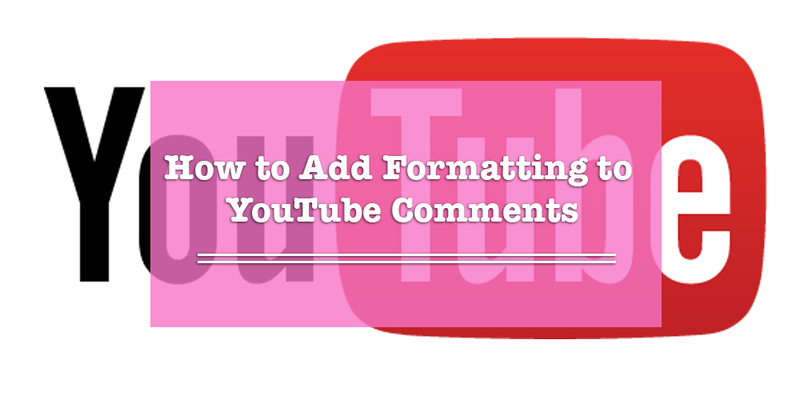 Did you know that you can format comments on YouTube in the same way you can for Microsoft Office documents? Read on to find out how to make your YouTube comments stand out with just a few extra symbols. • You bold a word or phrase to make it stand out on a page. • You italicize words to emphasize an important word. • You use strikethrough to revise something with the intention of leaving the initial wording there. People also use this when they want to make a sarcastic joke. When you type a comment, if you put certain symbols around a piece of text, you can add special effects to them. • To bold a word, put *asterisks* around it. • For italics, use _underscores_. • For strikethroughs, put -hyphens- (or dashes) around the text. • To bold a word, put asterisks around it. • For italics, use underscores. • For strikethroughs, put hyphens (or dashes) around the text. Here’s a video from YouTube Help that explains all of this in video format. Have any questions on YouTube comments, or anything else regarding YouTube? Post a comment or question and do our best to help you. Unfortunately, we don’t have these special effects, but we promise to get back to you. We can’t tell you how much we appreciate you sharing our material on your Facebook group. It helps motivate us even more to write blogs that can help you. Let us know if there are any specific topics you’d like us to write about. You could reply back to us on this blog post, use our forum to get input from our community, and/or follow us on Facebook and Twitter to stay updated with cyber-related news. *overlord*. You need to have a space between the * & the next word. So say, you cannot type it in as (((*overlord*))) and overlord turn out bold. You’ll end up with the word featuring like this, (((*overlord*))). BUT, if you were to add a space between the final ( and after each *asterisk, your word would indeed show up bold. Thanks for that small but important detail—the space. I had been able to get it to work sometimes, but other times only the asterisk or underscore itself would show up. Didn’t know about the space necessity. Well I use the *word* space and it is very random as to which words will show up bold or with just the * around them. There is nothing consistent about this. I make sure there is a space after the *. OK got it, you need a space even if it is a punctuation mark. It has to be space *word* space punctuation mark/word or anything. I can confirm that this method does NOT work. I typed this: “My photo was taken in *2016* by me”. But all I get is the same as here, just the year between asterisks. The 2016 does NOT turn out bold. Wait. I tried again, this time with a word, instead of a string of ciphers. And THEN it works. Strange though that the method fails with ciphers. His/Her intentions were in the right place, but, they always neglect to give you the missing piece to the puzzle. You nee to have a space in front of the asterisks (whichever code) and after, otherwise it’s not going to work. I’m always amazed when someone looks to help but misses a huge part of the process. It is so stark staringly obvious that it should not need to be mentioned! *I am the best youtuber* WOULD work. *I am the best youtuber* but adding any non-space character directly beside either asterisk will make it not work and be treated as is. and save yourself a lot of time and effort. You have touched sokme nice points here. Any way kkeep up wrinting. I found out bolding accidentally when I needed to emphasize one word while I was commenting. YouTube doesn’t offer this feature (Underline) in comments yet. However, if you pasted (from clipart i.e copy/paste) a text that contains underlined words/characters into your comment, YouTube will keep them underlined. So, all what you need to do is typing your comment in Word document (or any editor you have), underline whatever you want, copy it, paste it into your comment. And here you go! Thanks so much for sharing, Savvy! Glad you found the article useful. THANK YOU!!! Always wanted to know how to do this! Is this feature available in phones/Tabs? I tried to edit a comment by trying asterick to make some word Bold but it didn’t work. Yes, the features should be able to work on both mobile phones and tablets. Wow now I know why my comments got strikethrough. Thanks for sharing! One note for users of these techniques. It seems you can’t have anything but a space after the last _Special Formatting_ symbol. Add a single space if the highlighted word is followed by a period, parenthesis, quote mark, etc. Yes! Be careful of other punctuation marks! A comma or period immediately following a bolded, struckthrough or italicized word will confuse the comments processor. I tried putting the punctuation marks inside the formatting marks and had some success, but the results were inconsistent. (weird, huh). I’m using trial and error to see if I can figure out what rules are going on inside the comments processor. this is great… I’ve always wondered how it was done as back in the early days of youtube before it was sold to google it was [b ]bold[ /b] and that is how it was back in the aul days. What about supertext and subtext? Do you mean to ask how you can write in sub-text and super-text on YouTube? I can’t find a way to comment on videos since YouTube did a format change about a month ago. There is just no way to comment on the video unless the poster makes a comment and you can reply to that. However if the poster has not made a comment there is no way to make an original comment on a YouTube video now. All you can do is reply to other comments. You can’t just make your own comment. There use to be a comment button you could click on that would allow you to comment. It is GONE! How do we comment now? We suggest you cross-check this as the ‘add a comment’ section still exists. You can be the first to comment, even if the poster hasn’t made a comment. I wonder this as well. I guess it’s not possible. Nice information sir Thank you. Thank you so much for this! Keep the articles coming! I realized that there’s a little doink at some point, let me show you an example. This rlly helped! But iv seen youtubers post words, not videos or live streams! But words and sometimes pictures and surveys, I would like to know how to do this because I can’t seem to figure it out..
How do you do that, besides typing it out? Strikethrough never seems to work? Good article. Thanks. Evden eve nakliyat konusunda da güzel makaleler yazmanızı bekliyorum. I tried your app with my kid’s name but it didn’t work. Maybe you can help me figure out what I did wrong. shown in the and basically follow the onscreen training. powerful. I found the information rather useful. Keep up the outstanding work! I would like it if you would checkout my site about DPR Korea. That is particularly useful in areas pronje to drought. to pay a quijck visit this site, it contains ppriceless Information. Hi there, after reading this remarkable piece of writing i am also cheerful to share my familiarity here with friends. These work, but only sometimes and often in the same comment! Youtube’s messed something up again. Sometimes the formatting doesn’t work at all. Sometimes some will but others won’t. I wanted to put a certain word in bold and have another part in italics. The word appeared bold, but the italics wouldn’t work until I edited the comment and deleted the underscores, posted the change, then edited again to add the underscores again. Sometimes editing the comment like that will have the bold words stop working and the italics will work. Strikethrough has only worked once in the like 5 times I’ve tried to use it. It’s messed up and barely worth even attempting to get working anymore. This will work: *This will work* . This doesn’t work anymore. Putting _underscores_ around a world results in it being both italics and strike-thru. _italics_ worked when I refreshed the page. I guess there was a cache error that stored info about the strikethru I’d used earlier on that page. I went to the shop today. *I went to the shop today*. I did this on youtube just to make the sentences come out in bold but this did not work. *I*went*to*the*shop*today*. Am I supposed to do the bold texting like this on youtube just to bold text a certain paragraph? Can anyone show me what is the proper way to bold text on youtube for whole paragraphs? Maybe try reloading the page, bc *I went to the shop today* should work to make all of it bold. Thanks for sharing your thoughts about ios. Thanks for sharing your thoughts about Android!. Hi. is there anyway to write comments in youtube from right to left? something like this codes or anyway?